The material of the shoes is added with special polymer chain， making the products possess the permanent anti-static capacity. It obtains better damp-proof, anti-fungal and antioxidative capacity. Product Information: The material of the shoes is added with special polymer chain， making the products possess the permanent anti-static capacity. It obtains better damp-proof, anti-fungal and antioxidative capacity. Moreover, the product is never affected by the temperature, it will not harden in the low temperature with great reelability, good heat insulation,nice heat preservation and better ventilation. The scientific material formula contributes to its good shape, suitable hardness and elastic design, comfortable vamp design. Made by the healthy glue, the shoes will not break even under 3000 to 6000 times continuous buckling, the quality is very brilliant. Majorities of skid-proof shoe sole as well as various decorative pattern and sanitarian design , whose mould is complete, make the product more humanized and enable to release the work pressure. We own plenty of different style shoes and there are also lots of different shoe vamps style, and it is acceptable to invite and develop new products as the clients’ demands, we also offer the service of printing the corporate logo. Material of Upper Vamp: leather, canvas, anti-static cloth. 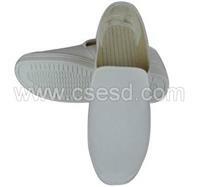 Material of Shoe Sole: anti-static plastic. Wearing anti-static shoes is the most efficient and reliable way to release the operator’s electrostatic charge,.Meanwhile, Ii can prevent the dust generation of the human in the dust-free room, which is the best choice for the electronics, semiconductor manufacturer and dust-free room.